Rufus Rabbit rattle in a box in lovely shades of pink for a baby girl. Best keepsake gifts by Rufus Rabbit at affordable prices. 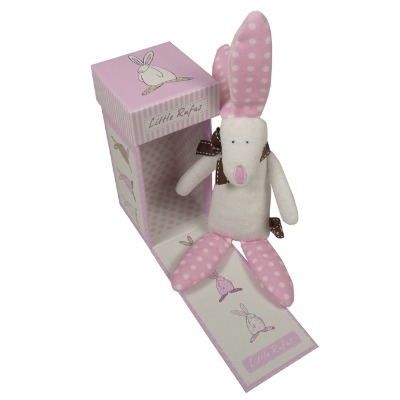 This Rufus Rabbit rattle in a box is supersoft and comes in white with the most adorable shades of pink. A cute little gift for any cute little baby, it will be one that can be kept and loved even when chewed and dog-eared as a reminder that they were young once! With crinkly ears and a tinkling bell, this adorable super soft rabbit rattle is packaged in a truly lovely little bunny gift box. All Rufus Rabbit lovely baby products have passed the relevant safety tests which make this rattle perfect for drooling, chewing, loving and playing with! There's a blue for boys that's just as cute oir a zingy yellow and green version (just for a change!) - check out Lovely Lane Baby for the rest of the range.